The color challenge over at Splitcoast today is Rich Razzleberry, Very Vanilla and Regal Rose with butterflies for dessert. What a delicious color combo…don’t you think? First off, I stamped the Magenta image onto a piece of ivory Gina K.’s heavy cardstock. Memento inks work very well for coloring with Copics, so I used the Tuxedo Black. Next the flowers and leaves were colored with a mix of these Copics: BG93, BG96, G99, R81, RV09, RV11,V04, V06 and V09. Then I used some Tombow Multi adhesive to add some Chunky Black glitter in the center of the flowers. The bottom layer of the butterfly is done in the same manner. 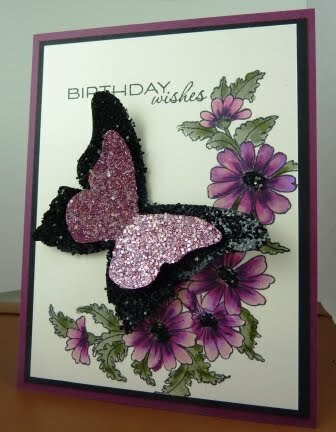 The butterfly is made by using two different sizes of the Stampin’ Up! Beautiful Butterflies Bigz die. For the top layer of the butterfly, I custom mixed some glitters to achieve the color I wanted: Chunky White, Fine Cosmo Rose Pink and Fine Supernova Pink. All glitters are from Stampin’ Up! And, finally, the sentiment is from Waltzingmouse Stamps. The cardbase is a standard A2 size in Rich Razzleberry and topped with a layer of Basic Black, both from Stampin’ Up! Your card is absolutely stunning! Your rocked the color challenge today! This is my first time visiting your blog and I LOVE the BG and header! Thanks for your kind comment on my card on SCS! Hugs! Previous Previous post: Another two post day!